Heriot’s and Currie will clash at Goldenacre tomorrow (kick-off 2pm) knowing that the winners will take a massive step towards securing a BT Premiership play-off spot. With the top three sides already well clear, it appears to be a race for fourth and matches between the two are traditionally tight affairs. However, Currie shattered that trend earlier in the campaign with a convincing win at Malleny Park. A repeat would leave the visitors with a seven-point advantage and close to ensuring their involvement in the knock-out phase. A win for the hosts will hand them the initiative in the concluding weeks of the league programme. It would also secure the Bill McLaren Shield and would make the champions the first recipients of the award since Ayr five years ago. At the other end of the table, Watsonians welcome Gala with both teams desperate for points to ease relegation concerns. “We know it is a big match and Gala will come to Myreside looking for an away win, so the guys will have to put in a good shift to get the desired result,” said Sonians coach Marcus Di Rollo. Boroughmuir also still have work to do to guarantee survival and the Meggetland men face a tricky assignment away to Ayr. 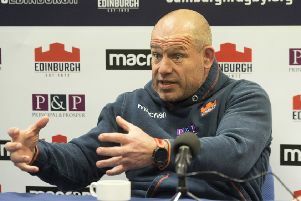 Muir, who took the honours when the teams met in the Capital earlier in the season, have Edinburgh scrum-half Nathan Fowles available, while Craig Keddie moves into the second row for the injured Jamie Ure.